Luckily, they’re almost brand new, just a little worn. (The previous pair was in tatters when I bought this one.) I also found my footless tights and the wrap skirts I usually wear for classes. But I couldn’t find any leotards. What in the world happened to them? I think I must simply have worn them out. So today I went to Patterson’s to buy new ones. The store was filled with girls trying on ballet shoes for the new semester, doing pliés and relevés at a barre. To be honest, I’m a little intimidated every time I start dancing again. When I was a child, I stopped taking ballet before going en pointe, and since then I’ve only done it for exercise. I always envy the girls who took it all through their teenage years, who are far more graceful than I will ever be. But I can’t think of anything that challenges me physically the way ballet does. I suppose that’s why I take it. It’s the same impulse that makes me want to learn classical Greek. The Boston Ballet School has a studio about a half-hour drive away. I think I’ll take lessons there, rather than in the city, although I love the main studio downtown. It has classes that are called Beginner, Elementary, Intermediate, and Advanced. The Advanced classes are for current or former professional dancers, which is a level I’ll never achieve, of course. So really there are three levels for me. I’ll need to go back to the Beginner classes, to start with. It’s been too long since I’ve danced. 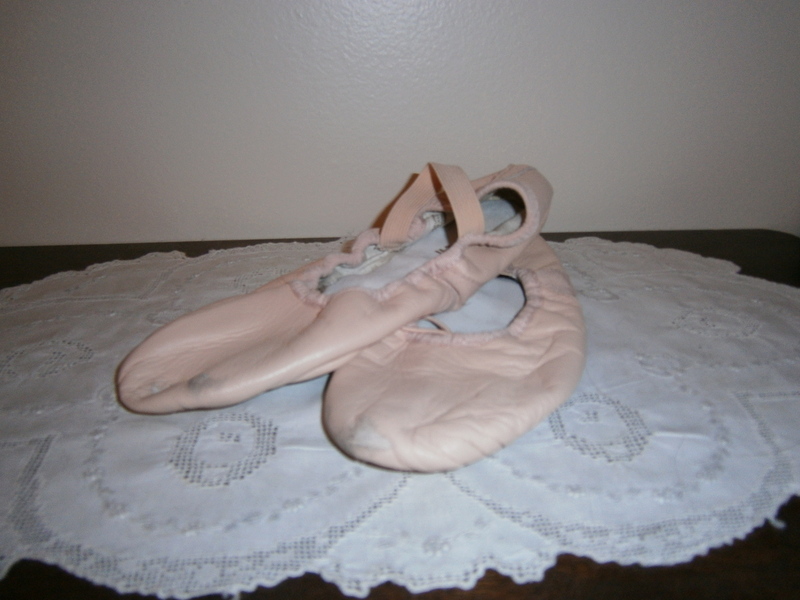 When I tried on my ballet shoes, I realized just how much I’ve lost: those strange things ballet develops, like muscles under the foot and flexibility bending the foot. I remember how it used to feel, to move each muscle separately, to have that sort of control. I don’t have that anymore. So this is an experiment, to see if I can still do it. If I can dance again. In the afternoon, I went to Concord, to one of the antiques shops there. 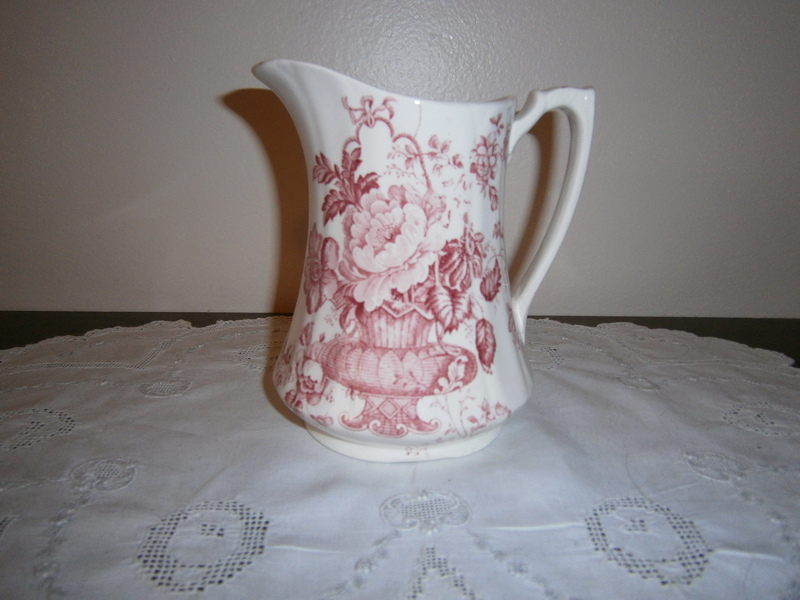 I bought a Meakin transferware pitcher ($18). 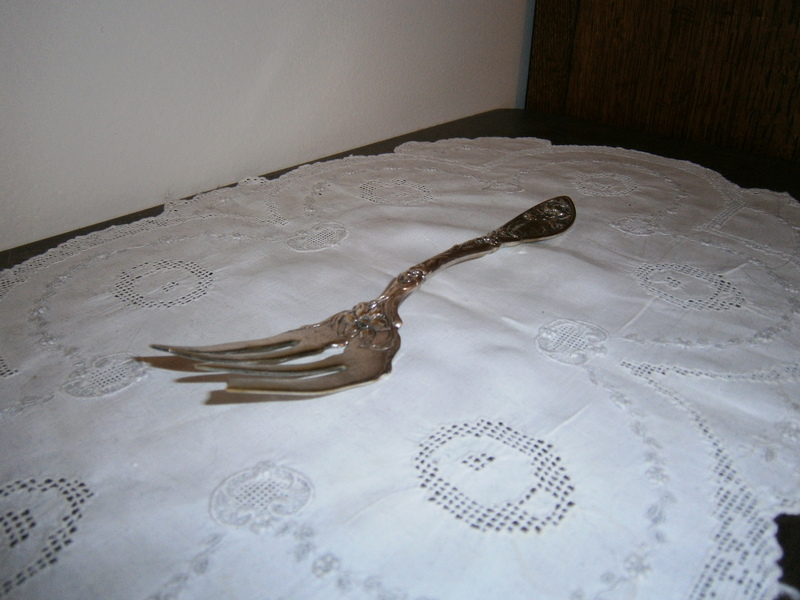 I also bought a silverplate serving fork with one of my favorite patterns on it ($12). And then I drove back to the house and began to prepare for winter. I can already feel a chill in the air, especially at night. So I put creamy flannel sheets on my bed, replaced the fan with a heater. But I’m not doing the things I usually do, planting bulbs for instance. This is a transitional period, so instead I’m preparing for the transition, however and whenever it comes. Sorting through books. Making sure I have what I need, giving away what I don’t. I think that’s a good thing to do, in autumn, which is a transitional season anyway. I’m looking forward to dancing again – literally and metaphorically. I wonder how many writers, especially those of a lyrical or poetic style, were once dancers or musicians, or at least feel an affinity with musical arts. I love your pitcher. You know, Dora, you’ve always given me the impression of a dancer, even though I didn’t know until this post that you had done ballet. The way you move and hold yourself always as that aspect of the graceful, even if you may not be conscious of it. I’m glad to hear you’ll be engaging that part of your life again. I think things like dance permanently change how you stand and move, so you end up looking a certain way. I think dance changed the way I hold myself . . .